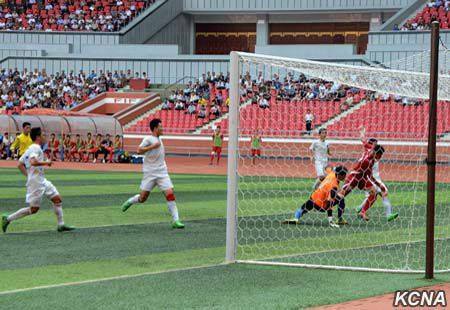 Posted in Senza categoria and tagged dpr korea league on settembre 1, 2015 by calciocorea. 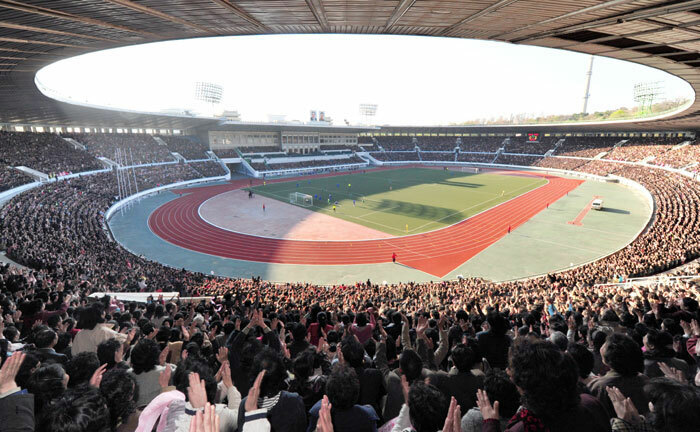 The men’s premier soccer league for Torch Cup goes on here, divided into two groups, starting on July 27. 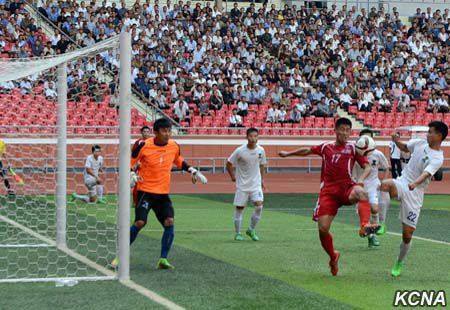 Included in group A are April 25, Pyongyang, Amnokgang, Sonbong, Chobyong, Myohyangsan and Ministry of Light Industry teams and group B Ponghwasan, Kigwancha, Wolmido, Sobaeksu, Rimyongsu, Hwaebul and Jangsubong teams. 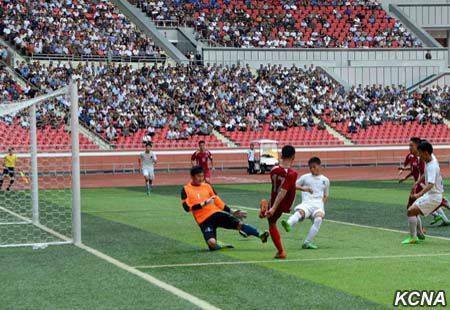 April 25 and Pyongyang teams are winners in the Mangyongdae Prize Sports Games and the Sports Contest for Pochonbo Torch Prize. 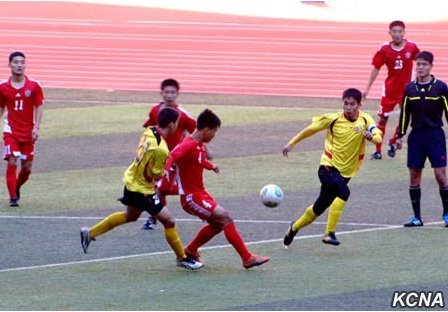 Taking the lead in group A round robin are April 25, Pyongyang, Ministry of Light Industry and Chobyong teams. 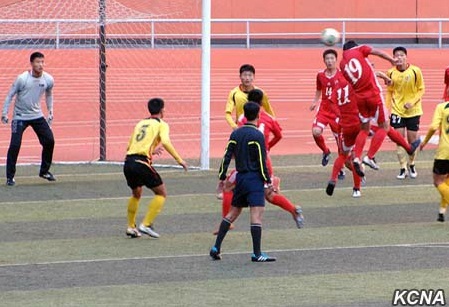 The April 25 team scored ten goals in the matches with Amnokgang and Myohyangsan teams. In group B there were eight matches until now, six of which ended in a draw. The group league matches will come to a close on August 24 and there will be the semifinals on August 25 and the finals on August 28. 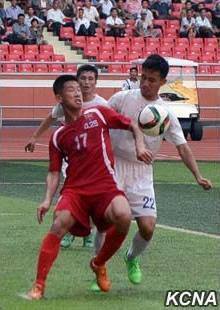 Posted in Senza categoria and tagged dpr korea league on agosto 10, 2015 by calciocorea. 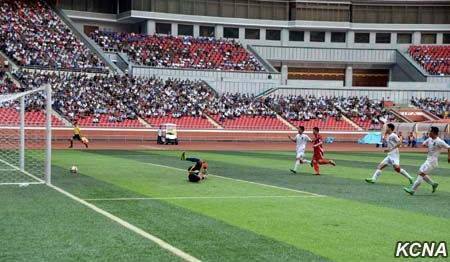 Pyongyang, 3 dicembre (Kcna) – La squadra Hwaebul (torcia) squadra in Corea Popolare è emersa come una potenza calcistica nel paese. La squadra ha ottenuto il primo posto nella Premier League maschile per i Campionati della RPDC giocato tra dal 20 settembre a fine ottobre di quest’anno. E ‘stata creata nel maggio Juche 102 (2013) come un gruppo di calcio del Comitato Centrale della Lega Socialista Giovanile Kim Il Sung. Il leader supremo Kim Jong Un la chiamò Hwaebul nel senso che dovrebbe diventare una scintilla per alzare il vento caldo sullo sport in tutto il paese. La squadra Hwaebul ha fatto il suo debutto nella Premier League maschilenel Concorso di sport Premio Torcia Pochombo, arrivando prima. 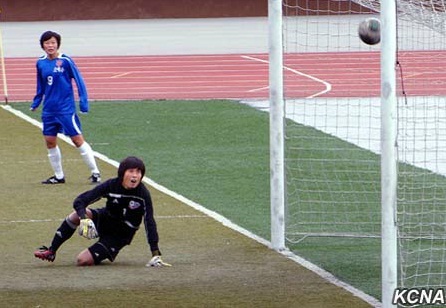 Posted in Senza categoria and tagged dpr korea league, hwaebul on dicembre 3, 2014 by calciocorea. Posted in Senza categoria and tagged dpr korea league on dicembre 1, 2014 by calciocorea. 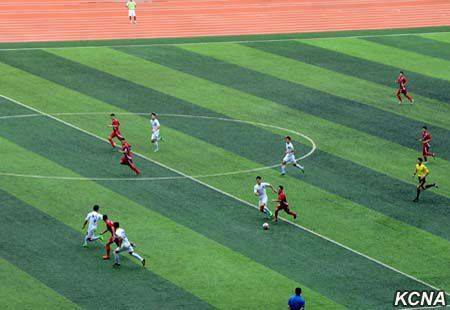 Pyongyang, November 3 (KCNA) — Premier league football matches for the DPRK Championships finished in Pyongyang. 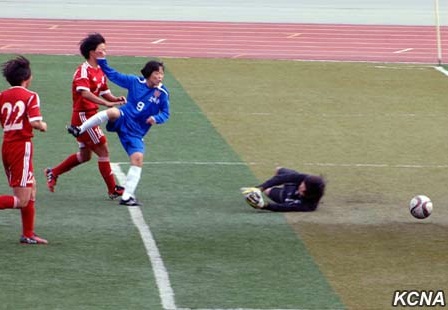 In the 40 day-long competition, the Hwaebul Team came first in the men’s event with seven wins, three draws and one defeat and the Pyongyang Team in the women’s event with nine wins and two defeats. The April 25 Team and the Amnokgang Team took the second places respectively in the men’s and women’s events. A total of 377 goals were witnessed in the league matches with 12 men’s and 12 women’s teams attended. Posted in Senza categoria and tagged dpr korea league on novembre 3, 2014 by calciocorea.